The trouble with most of our attempts to tell the story of Rome—to deploy Rome as a metaphor in current events, for that matter—is that we tend to focus on the end points: the failure of the republic, the last days of the empire. The real puzzle of Rome, for historians and political theorists alike, is not its failure but its survival. Even Edward Gibbon, chronicling the long centuries of decline and fall, insisted that "instead of inquiring why the Roman empire was destroyed, we should rather be surprised that it had subsisted so long." The fall of Rome was inevitable: not just determined by the usual forces of human stupidity, political ambition, and the silent artillery of time, but over-determined, with every historical force working in consort to bring the city low. The question we need to ask is not why Rome fell but why it didn't. And for that question, Matthew Kneale's new book is not unhelpful. Kneale, a fiction-writer by training, is the author of English Passengers (2000), an interestingly structured historical novel about Victorians searching for utopia in Tasmania. He intends his latest volume, Rome: A History in Seven Sackings, to be a nonfiction account, drawing on his deep familiarity with Italy, but the episodic, multi-character nature of his tale reminds the reader of the 20 different narrators who populated English Passengers. That's not to say Rome: A History in Seven Sackings is a particularly good book. The story is too fragmentary to be enjoyable as a whole and too varying in scope to be consistently informative. Sometimes we're up at the level of the mass migrations of peoples, and sometimes we're down at the level of the reasons for the miasmatic stinks of the Eternal City, and always we're swinging dizzily from perspective to perspective. But Kneale has produced what is nonetheless a genuinely useful book, reminding us that modern Rome is the survivor of sieges, occupations, depopulations, and desolations. Kneale describes, for example, Henry IV's 1081 invasion as finding a sort of "Gulliver's Travels‘ town"—with Romans "making their homes in the broken remains of thousand-year-old apartment blocks, in long dry baths, and in the storerooms and corridors of abandoned theatres and stadiums." 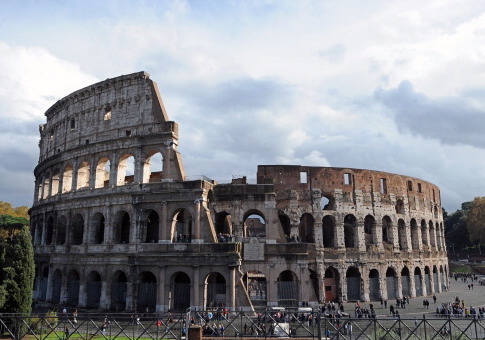 The Coliseum was, in essence, "the city's largest housing complex." Almost 900 years later, Ezra Pound would complain that Rome was a city run like a museum, but in the 11th century, Rome was a warren of scavengers, nesting in ancient ruins. Kneale's seven incidents (the title word "sackings" oversells the history) begin with the attack of the Gauls in 387 B.C., the event that haunted the Roman political imagination for centuries afterward. Most Roman histories offer the Vandals' invasion in A.D. 455 as the parallel bookend, encasing the reign of classical Rome, but Kneale looks instead to the Visigoths, led by Alaric, who invaded in 410, and the Ostrogoths, led by Totila, who ordered the complete evacuation of the city after defeating the Romans in 546. Kneale then adds two medieval assaults: the Holy Roman Emperor Henry IV's victory in 1084 and Charles V's invasion (with a portion of his troops Lutheran Landesknechte) in 1527. And Rome: A History in Seven Sackings ends with two modern chapters: the invading French Army's defeat of Garibaldi in 1849 and Nazi Germany's occupation in 1943, after the failure of Mussolini. It's such a strange tale. As Gibbon famously notes at the beginning of his Decline and Fall, the Roman Empire in the second century "comprehended the fairest part of the earth, and the most civilized portion of mankind." Pollution records drawn from arctic ice drillings suggest that the world would not reach the same level of manufacturing until the 19th century. A million people, at the city's peak, occupied the most powerful and productive place the world had ever known. And once the Ostrogoths emptied out the place in the sixth century, nothing remained but the ruins that an exhausted and, in some ways, alien population would eventually use to cower within. Kneale clearly considers his seven incidents as parallel to one another. Even while he casts his fiction-writer's eye over contemporary accounts, seeking the highly individual novelistic elements, he has a formula for each chapter. He begins with the invaders, preparing in anger or cupidity to march on Rome. Then he moves to the city itself at the moment, tracking down two trails: the ordinary life of the residents and the politics that produced the crisis. One of the interesting elements is how little destruction the modern invasions wrought. Kneale describes Charles V's 1527 invasion as "the sixteenth century's 9/11," with the Spanish and German troops of the Holy Roman Empire killing thousands of Romans and looting the city down to the crumbs. But the French victory in 1849 was astonishingly mild, directed at almost entirely political ends. "Of the seven attacks described in this book," Kneale admits, "without doubt this one was least like a sacking." But the chapter on the Nazis shows two other invasions that were equally not sackings: the takeover by the Germans in 1943 and the arrival of American troops in 1944. While the Germans did round up Jews and made plans to arrest the pope and confiscate all the banks' gold reserves, they did little comparable to the 1527 sacking, and the Americans did almost nothing but fill the city with U.S. dollars. Dovunque saremo, colà sarà Roma—"Wherever we may be, there will be Rome"—Garibaldi famously declared when he led his supporters out of Rome and abandoned the city to the French. But it was the fact of physical Rome, not of its people, that has kept the city from destruction in modern times. Think of this just in terms of the ancient remnants: No modern government, not even the Nazis, wanted to be the cause of destroying the Coliseum or the Pantheon. Sometimes, there is an advantage to being a city run like a museum. And then there's the papacy, which, to his credit, Kneale recognizes as not just an ongoing source of reasons for barbarians to sack Rome but also the source of the prestige that might make them hesitate to do so. The usefulness of Rome: A History in Seven Sackings comes with its reminding us of how often the city stood at the brink of annihilation. Matthew Kneale sees how Rome should have ended in 455, and in 546, and in 1527, and yet it didn't. Its destruction was determined simply by the rage of history; no comparable ancient city survives. And its destruction was over-determined, with all the various opponents of the Roman Empire, the Catholic Church, and Italy ranged against it. But somehow, the Eternal City remains. That, in itself, is a reason to pause yet one more time and think about Rome.